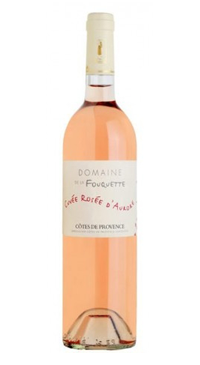 Isabelle and Jean-Pierre Daziano are the passionate winemakers at Domaine de La Fouquette, situated in the Massif des Maures mountain in Provence. They have been committed to offering quality organic products for the past three generations. Their vineyards cover 16 hectares on the North side of the massif des Maures; the soils are low pH schist clay. The vines benefit from intense and long hours of sunshine. The grapes that go into the roses are machine harvested at dawn and quickly transported to the winery in order to avoid oxidation. The grapes are directly pressed and the juice naturally settles for 24-48 hours. A three week fermentation at a low 15C preserves the wine’s delicate aromatics. 65% Grenache, 30% Cinsault, 5% Rolle.